Difference between revisions of "Monte Isola"
CanalTaxis were initially set up in late 2017, but have seen very few expansions since. It is not expected to see any future development, and is now being phased out due to the Monte Isola Tram, which provides better service without blocking the canals. The main exception to the phasing out is the GREEN line, which will continue to link both ends of the Monte Isola Tram route. The unblocked canals are planned to be used for sporting events such as boat races, Gondollama Battles, and more. The unblocked canals are planned to be used for sporting events such as boat races, the [[Gondollama Cup]], and more. Monte Isola is planning to use its' network of canals to host the [[Gondollama Cup]] and all related events. The events are being organized by the mayor via the Monte Isola Sporting Association, which is located in the western section of the town, opposite the Monte Isola Lighthouse. Monte Isola is planning to use its' network of canals to host the [[Gondollama Cup]] and all related events. The events are being organized by the mayor via the Monte Isola Sporting Association, which is located in the western section of the town, opposite the Monte Isola Lighthouse. It is expected to launch shortly after the city gets governor. "Llama capital of the MRT!" Monte Isola was founded at the dawn of the new world expansion, a time when many were rushing to claim the new territory. Vulpicula was reluctant to claim anything at first, but eventually came up with the idea for a town built using canals, instead of roads. 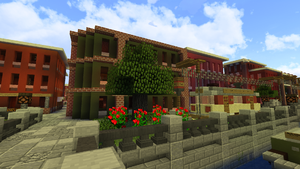 With the help of TonyTajiri, an Amsterdam/Venetian style of architecture was devised, with the original blocks being laid down on December 30th, 2016. One of the original goals for the town and more specifically its unique feature of having canals, was to someday host boat races in it. After the initial burst of development, progress slowed, with very little being done for close to a year. It wasn't until July of 2018, when the next major wave of development would take place. This wave resulted in the city finally getting to Councillor, then Mayor, and culminated in the construction of the Monte Isola Harbour. Development slowed in early august again, and the town went dormant again. This inactivity would be much shorter lived, however. Progress resumed in December of 2018, and resulted in the town's size tripling, eventually allowing it to reach Senator. Plans for the town grew increasingly more ambitious around this time, with help from the new deputy mayor, Autobus22. Large sections of the town began to be moved and changed to accommodate the Monte Isola Tram, along with the northern section of the city finally being constructed. There was a short hiatus again in January, but progress resumed, with the town continuing to push further north, and further west. The Gondollama, which is literally just a Llama riding a Gondola, hence (Gondollama), is an integral part of the town's history. The Gondollama as a town mascot is as old as the town itself, being founded a few hours afterwards due to a pun being made. The endearing little guy stuck around for months, until Mike24Dude killed him, and a new Gondollama had to be found, until that too was killed. The third Gondollama, known simply as Gondollama III, continues to boat around Monte Isola's canals, and has become a staple of the town. Many shops have been built to capitalize on the mascot, including a shop dedicated to Llama merchandise, and even a Rent-A-Llama. The town's motto was eventually changed to from "City of a Thousand Canals" to "Llama Capital of the MRT" to recognize the icon. Monte Isola is bounded on all sides by deep oceans, reaching 30 blocks deep in places. Its landscape was until late 2018, largely flat, until the town grew to the point where the original island was impossible to see. When land was still present, the tallest part of the island was the sandy mound nicknamed Storal Point, which reached a mere 5 blocks above sea level. The Monte Isola lighthouse now stands where the Storal point once was. Market Alley, a prime example of Monte Isola's unique architecture style. Monte Isola's architecture is a mix of Amsterdam and Venice, with various parts of other cities (both real and MRT) being mixed in to create the unique and colourful terracotta buildings that dominate the town. While the style has changed over the years, with the oldest buildings in the town being notably cruder than the newer ones, the use of terracotta to create a warm palette has remained the same. Often times these buildings will jut out on the second floor and above to create depth, and to maximize space, since many of the buildings are smaller than what one would find in most cities. Most of Monte Isola's buildings are designed to look fairly old (pre-1930s), with features common in the period such as brick arches and cramped stairways. Monte Isola is a city that is heavily focused on Tourism, both roleplay wise and in terms of attracting actual MRT members to visit. The main tourist areas and developments are listed below, and the list is expected to grow as the city expands. The Monte Isola Harbour Station. Behind it, lies the Harbourside Hotel. Not pictured is the Harbour itself. Monte Isola, being a town that is heavily reliant on the sea, has a massive harbour. Numerous passenger boats stop here, and like everywhere else in the town, there are tourist oriented shops and cafes that surround it. Boats aren't the only thing to stop in the harbour, as HarbourAir's hub is located nearby, as does a Monte Isola tram station (pictured). Towering above the Harbour, is the grandiose Monte Isola Convention Center, which is one of the biggest buildings in the entire town. While it currently lies vacant, awaiting 1.13, there are plans to feature an exhibit about sea life and climate change there. Outside of the Convention Center itself lies a hotel, and numerous small boats which will either try to sell you fish, or will try to catch it. 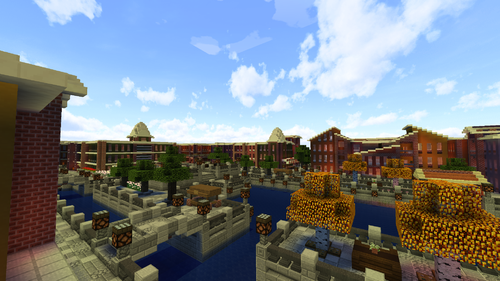 The harbour is currently put on hold, but is planned to be completely rebuilt when the city reaches governor rank. Market Alley is Isola's newest tourist focused area. It's one of the few canal-free pathways in the town, and instead has a tram line running through it, with numerous overhanging shops that are densely packed around it. Each building is filled with local businesses, and the canal pathways on both ends are unique in the city in the fact that they go underneath a building. 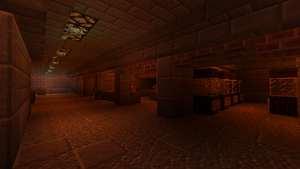 In the center of it all is the Market Alley tram station, which provides regular passenger service to those wishing to visit this cozy area. 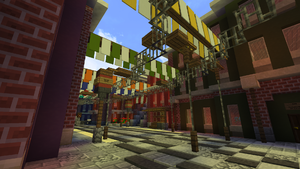 Another unique thing about Market Alley, is the upper area. 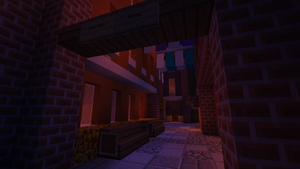 By taking the stairs on the eastern side of the alley way, more shops can be accessed. It's the only part of the city to have a raised pathway like this, and this pathway is eventually planned to end by leading to an outdoor amphitheater. The currently built area features dozens of local stores, including cafes, boutiques, record shops, a chocolate store, one of the most luxurious hotels in the city, and many more. A view of the museum inside the Merchantman Canal. Monte Isola is also home to a covered canal, which was buried during the construction of Merchantman's Canalway station, which continues to serve it to this day. Instead of abandoning the canal, it was drained, and then expanded to allow for shops to be built there. A museum containing artifacts about the canal's lore is present, and offers a free booklet giving a full history to anyone who is interested in the extremely rich and at times stupidly drawn out history of this canal. The small shopping area features two cafes, one of which is one of the very few new world TheSpoon locations, a RailFan's shop, and an Antique store. The Merchantman Canalway is one of the most hidden of the major tourist spots, and is also one of the smallest. A view from the western entrance of the Monte Isola marketplace. The Marketplace is a densely packed shopping area, much akin to a flea market, although with a strong fishy smell to it. Locals come here to peddle their wares day after day to customers, and sell anything from fish, to vinyls, to throw-able vinyls designed to be used as weapons, to things stolen from other shops. If you can get over the smell, there is much to be found here. 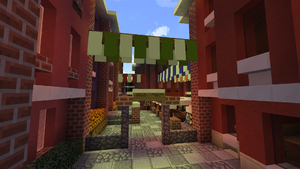 The central marketplace isn't the only thing in the area, however, as surrounded on all sides are more buildings. One of the few Cat Cafes found on the MRT is located at the western entrance to the marketplace, along with Isola Whale Tours and their designated private dock. 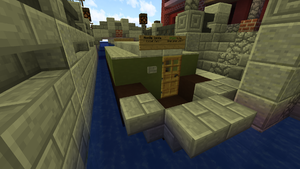 A CoffeeFox, Froggy Piano, and a slightly criminal fishing bait shop (which is coincidentally just next door to the mayor's house) can be found towards the eastern entrance of the Marketplace. Furthermore, the Marketplace is a stone's throw away from the lighthouse, and in the future is planned to be served by the currently expanding Monte Isola Tram Line. The eastern entrance to Storalia Alley at night. Storalia Alley is a comparatively new and quiet section of the city that is located north of the Town Hall, and east of the Monte Isola Marketplace. It is a curved alley that cuts into city block 8, that is surrounded by greenery and shops, such as the Coastal Tulip Cafe. It currently has numerous vacancies that are in need of filling, with the majority of shop spaces currently being empty. Those who are interested in filling a vacancy should contact mayor Vulpicula in game. It is named after the nation of Storalia, of which the city is a part of. Those wishing for a quieter experience can opt to visit one of the town's museums, which are scattered all throughout Monte Isola. There's a small museum located inside the town hall, a museum dedicated to sailing that is located near the lighthouse, and a small museum found inside the Merchantman's Canalway. For those interested in reading, there's the Monte Isola Public Library, which was one of the first libraries to join SAIL, and many private bookstores that sell both new and second hand books. Monte Isola, despite being an island town, has an internal transit network designed to carry tourists and visitors around the island, primarily stopping at the most interesting sections such as the aforementioned Market Alley. Standard CanalTaxi, which is part of the GREEN Line. Monte Isola's oldest form of transit is the CanalTaxi, and is based on the Narrowboats used to traverse the United Kingdom's narrow canals. It is normally four blocks wide, and thirteen blocks long. The unblocked canals are planned to be used for sporting events such as boat races, the Gondollama Cup, and more. One of the trams used in Monte Isola. Monte Isola's newest and soon to be primary form of transportation is the Monte Isola Tram. It is not currently operational, but is expected to enter full service by the end of 2019. Unlike CanalTaxi, it is capable of taking passengers directly to Monte Isola's most notable areas, and still leaves the canals wide open for public use. The tram is a result of cooperation between Vulpicula and Autobus22, with Vulpicula handling the infrastructure and construction, with Auto handling the trams, rail, and routing. The planned route is designed to move through the town in a horseshoe shape, starting at the Monte Isola Harbour, passing through Merchantman's Canalway, Market Alley, and eventually ending 20 blocks east of the Monte Isola Marketplace. From there passengers will be able to ride a CanalTaxi back to the start of the line. 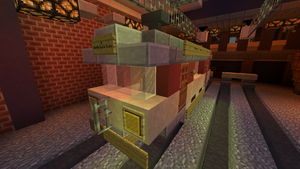 The tram design itself is based on some of the most notable trams from the 1920s, with some changes made to help the styling fit the town more. Monte Isola is planning to use its' network of canals to host the Gondollama Cup and all related events. The events are being organized by the mayor via the Monte Isola Sporting Association, which is located in the western section of the town, opposite the Monte Isola Lighthouse. It is expected to launch shortly after the city gets governor.